This week I have been working with my friend Hassane El Khoury on his hobby project which has the SSD1306 in it. [if you want to know more about the project, leave a comment and maybe he will answer the question]. I have been helping him get a number of things going including this display which I have written about before. 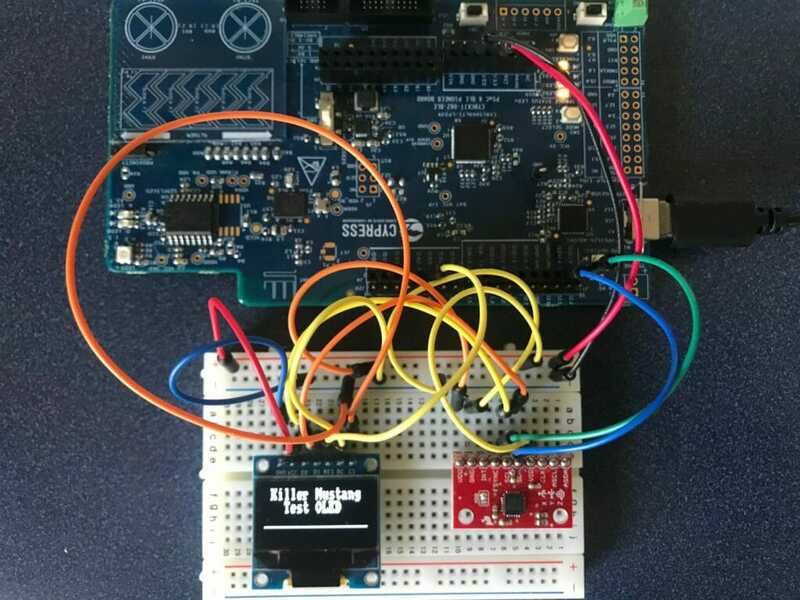 This article describes the integration of the SSD1306 OLED Display into his project with the PSoC 6 & FreeRTOS. Hassane started his career as an Automotive System Designer, then he worked as an Applications Engineer, so he has “mad” skills in this area. He is building his project with a PSoC 6 and is heavily using FreeRTOS (which is new for him). He has been distracted with some other thing the last few years, so I have been serving as a consultant on the latest PSoC stuff to smooth the learning curve. In this case PSoC6, FreeRTOS and the SSD1306 OLED Display. I have only used the SSD1306 OLED Display with PSoC 4 and WICED, but I ASSUMED (incorrectly assumed… which I will talk about in the next article) that there would be no problems making it work in that environment. Hassane is all about reuse and he had copied the design of this section of his project from my article on using queues with FreeRTOS. It looks like this. Send the number of bytes called for. In the next article Ill talk about the SS1306 and a problem that I created for myself. Is the full code for the OLED and FreeRTOS integration available on Git? I thought I uploaded it to github… but apparently not. Did you manage to find the code to push up to GitHub? Yes… all of that code came from the referenced P4.